Welcome. I'm Nick. I love beer and Baseball cards. Like most I collected junk wax as a kid in the 80's, then I stopped in the early 90's when I discovered girls. Well now I'm back, and with the help of this Blog I'll be taking you through my Quests in collecting. I've been fortunate enough to meet some amazing collectors via Twitter and this Blog. I'm a big fan of trading cards, I"ll trade with anyone anywhere. This recent transaction with Twitter friend Kevin (Aka @porterman20) was exactly what trading cards should be about. Kev is a Red Sox guy, so it's a perfect fit for us, I send him some Sox he sends me some Yanks. We've done this a few times over the years. This last package I got from him was awesome! It's an awesome mix of Hits, Base, Slabbed and Vintage. Everything this Yanks collector could ask for. Now, admittedly I don't mess around much with grading, and what I do mess with is normally through PSA. I may have had a change of opinion though after getting this sick Munson SP, it looks great in it's BGS home. And what bout that Yogi? That card is everything I love about collecting. I love the mini, the frame, his face and that old cloth. Kevin, I can't thank you enough! I look forward to us continuing to build each others collection for years to come. For the rest of you, This is how I trade: If you collect a certain team I'll send you hits, inserts, base, and anything else you may or may not be looking for, I just ask for a comparable package in return. Shoot me a message if interested. 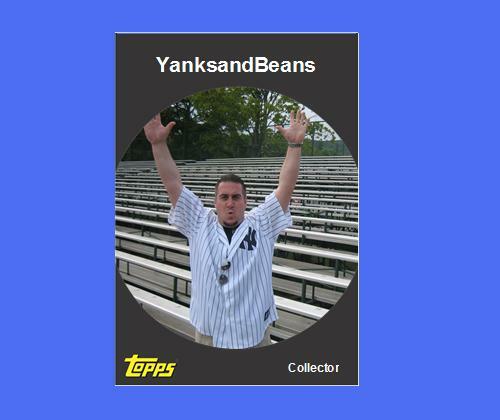 I collect all Yankees with a lean towards Jeter, Munson and Rickey Henderson. I'm also a Mark Teixeira Super-Collector! Warning: A Lot of cows were harmed for this post.